Majestic Media Server is a Universal Plug and Play (UPnP) media server application, which is installed directly on a Mac OS computer and allows streaming of iTunes, iPhoto, and other media content to devices that support UPnP, including the Sony PlayStation 3 (PS3) game console. This guide explains how to configure the Majestic Media Server to stream media from a Mac-connected Drobo, Drobo S or Drobo 5D to a PS3. Serviio is a free Digital Living Network Alliance (DLNA) media server application that is installed directly on a Windows computer and allows streaming of media files (music, photos, or videos) across the network to any DLNAcertified device including the Microsoft Xbox 360 game console. This guide explains how to configure the Serviio media server to stream media from a PC-connected Drobo, Drobo S or Drobo 5D to an Xbox 360. Note: The latest version of Serviio is available as a free download directly from the Serviio website (http://www.serviio.org). TVersity is a Digital Living Network Alliance (DLNA) media server application that is installed directly on a Windows computer and allows streaming of media files (music, photos, or videos) across the network to any DLNA-certified device including the Sony PlayStation 3 (PS3) game console. This guide explains how to configure the TVersity media server to stream media from a PC-connected Drobo, Drobo S or Drobo 5D to a PS3. TVersity is a Digital Living Network Alliance (DLNA) media server application that is installed directly on a Windows computer and allows streaming of media files (music, photos, or videos) across the network to any DLNA-certified device including the Microsoft Xbox 360 game console. This guide explains how to configure the TVersity media server to stream media from a PC-connected Drobo, Drobo S or Drobo 5D to an Xbox 360. Note: TVersity offers a free edition and a paid Pro edition of their media server application. Both editions stream media from a PC-connected Drobo to an Xbox 360. The Pro edition adds features including video streaming to mobile iOS devices and premium content from providers such as CBS, ESPN, and Hulu. The latest versions of TVersity are available as free downloads directly from the TVersity website (http://www.tversity.com). 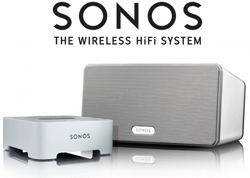 Sonos is one of the most popular systems for streaming music in the home. It can access a wide variety of Internet radio stations, music subscriptions services, and also your own music on a computer or storage device. In this guide, we'll show you how to put your music on a Drobo and stream it to Sonos. I'm using a Drobo 5N as an example, but you could also use other network-attached Drobos or even a directattached Drobo connected to a always-on computer in your home (like a Mac Mini server).